1983 Topps Greatest Olympians, $10; NM-, $5. 1983 Topps Olympic Heroes M&M, $10. 1986 Question of Sport, $10. 1989 Historic Fights (vs. Qawi), $2. 1990 Question of Sport, $6. 1991 All World (vs. Ali), $2. 1991 Kayo Battle of the Ages Silver Hologram (w/Holyfield), $10. 1992 Kayo Gold Hologram, $7. 1992 Kayo Battle of the Ages Gold Hologram, $7. 1992 Legends postcard, $10; poorly-cut, $1. 1992 Power, Punches & Pain (w/Holyfield & Tyson), $10. 1992 Tuff Stuff, $10; NM-, $5. 1993 Ageless Wonders w/Nolan Ryan, $10. c1979 Cigar Band (Netherlands), $10. 1994 MGM slot token, $20. 1995 MGM slot token, $20; circulated, $12. 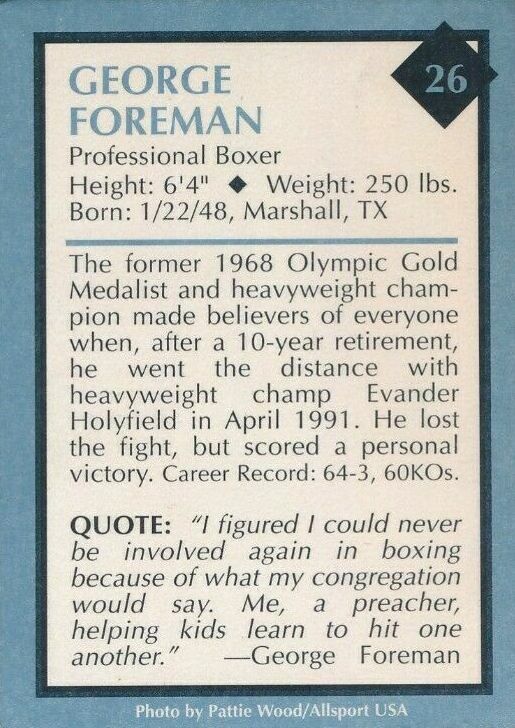 1995 Foreman/Schultz 3" pinback, $15. U.S. $1 bill (Foreman on face), $5.